While many perceive China to be the antagonist in a ‘new cold war’ with the US, this Foreign Policy  article accuses US President Donald Trump of being behind the deterioration in relations. Playing down the cold war fears, Graeme Dobell  argues competition does not mean confrontation. Still on China, an ASPI ICPC report  brings to light the rapid expansion of ‘re-education’ camps in Xinjiang province. In an investigative piece based on ASPI’s research, the ABC  reports that it’s believed up to two million Uyghurs and members of other Muslim groups have been detained in these camps in violation of their human rights. Following the murder of Jamal Khashoggi and amid the ongoing war in Yemen, Al Jazeera  has the latest on European arms sales to Riyadh, reporting that, unlike Germany, most European nations will continue arms exports to Saudi Arabia, alongside the US. Defense One  brings you the US commander in the Middle East’s thoughts on the ‘extraordinarily important’ US–Saudi relationship, while the Financial Times  examines the renewed calls to end the war in Yemen. The New York Times  has put together another graphic piece on that war, this time focusing on its impact on Yemeni children (warning: content may be ignored by the international community). Far-right populist Jair Bolsonaro, dubbed ‘Brazil’s Trump’, has been elected as the country’s next president. This BuzzFeed article  from earlier this month has six facts to know about Bolsonaro, including details on some of his very controversial views. The Economist  similarly dissects his program and looks at the effect positivism had on liberalism in Latin America. And in New Statesman , using Bolsonaro’s victory as an example, Paul Mason explains how quickly the middle class can punish the elite in today’s fragile and unstable circumstances. A new leader ascending to power in one part of the world, another one heralding her exit from politics. Angela Merkel announced she’ll step down as her party’s leader this year and won’t seek re-election as Germany’s chancellor in 2021. The Strategist  brings you analysis on the step-by-step withdrawal and Merkel’s potential successors and Philipp Liesenhoff explains  in the Washington Post how German political parties should see this as an opportunity. Meanwhile, as the US midterm elections loom, Vox , using data from the Pew Research Center, mapped the biggest divides between Democrats and Republicans. See this ABC  opinion piece for how the vote could be the first referendum on the Trump presidency and the New York Times  on how the economic situation in key states could influence the vote. Now for some different perspectives on the deadly attack in Pittsburgh’s Tree of Life Synagogue on Saturday: Jeff Blattner  shares insights into the bonds that tie Pittsburgh’s population together; David M. Shribman  commends the city’s religious harmony and tolerance; and Wired  looks at how bots played a significant role in pushing Twitter activity on this incident and other news events. Let’s finish with a quick whip around the world. Some interesting research  coming out of Chatham House provides advice on the approach the UK government should take in its Russia policy. This Atlantic Council analysis  looks at the dire impacts on Ukraine of around 25% of its workforce being employed abroad and how the brain drain could be reversed. Joseph Goldstein  tells how and why Uganda welcomes refugees with open arms, after the government there made ‘hosting refugees a core national policy’. The US Navy is developing high-energy laser weapons, railguns and advanced gun-launched guided projectiles to enhance the survivability and effectiveness of its ships. There’s an interesting Congressional Research Service report  which covers these important technologies. Sticking with the US Navy, plans for a 355-ship force are being revised, with calls  for a fleet of 400  ships by 2039. Such a fleet would be 40% larger than the current navy. Interestingly, an article last year from RUSI  suggested China was aiming for a 500-ship navy and an article  in The Drive echoes concerns that China’s PLAN will overtake the US Navy in size over time. Warrior Maven is posting  on how the US Army is evaluating new intelligence analysis technologies in order to fuse multiple sources of intelligence—drones, satellites, geospatial data and SIGINT—into a coherent multi-spectral intelligence picture. National Defense has a six-part series on the US Army’s priorities for modernisation, starting with a piece  on how soldiers can be helped to better do their jobs. Small Wars Journal looks at the idea of technological fluency  and how it might apply to the use of special forces between 2030 and 2050. The article is part of the ‘Mad Scientist Initiative’  and is sponsored by the US Army’s Training and Doctrine Command. Finally, no Tech geek column would be complete without a mention of space. Asteroid mining  is one of the coolest upcoming ‘big space’ projects, with ‘start-ups’  like Planetary Resources vying to get rich from mining space rocks. Here’s a forecast  through to 2025 that shows there are big bucks to be made on the high frontier. The 1991 Madrid Conference  was the first time Israel came together with its neighbours and Palestine to discuss peace in the Middle East . The meeting aimed to produce more peace treaties between Arab countries and Israel following the 1979 Egypt–Israel treaty and is said to have paved the way for the Oslo Accords in 1993. 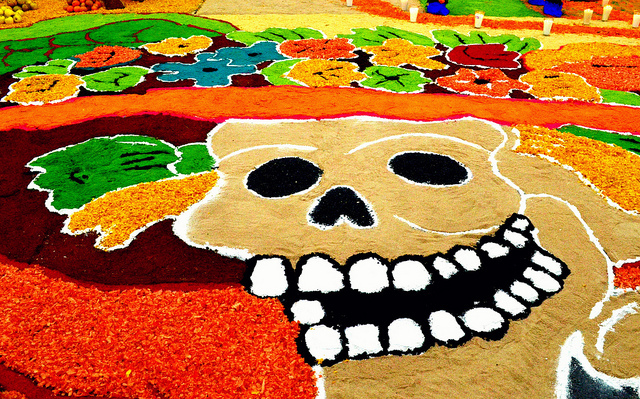 On a more colourful note, see this BBC  photo series on the Día de Muertos (‘Day of the Dead’) parade in Mexico City. Melbourne, 5 November, 1–2 pm, University of Melbourne: ‘Constitutional reform in Sri Lanka: meeting majoritarian challenges while providing for meaningful devolution’. More information here . Canberra, 5 November, 5:30–7:30 pm, ASPI: ‘In-conversation: women in defence—Australian and Swedish experiences’. Tickets here . Canberra, 8 November, 9:30 am – 12 pm, ANU: ‘Deep conversation: the many tipping points before 1.5C’. Register here . Jacqueline Westermann is a researcher, Malcolm Davis is a senior analyst and James Brorson is the program development coordinator at ASPI. Image courtesy of Marysol on Flickr.